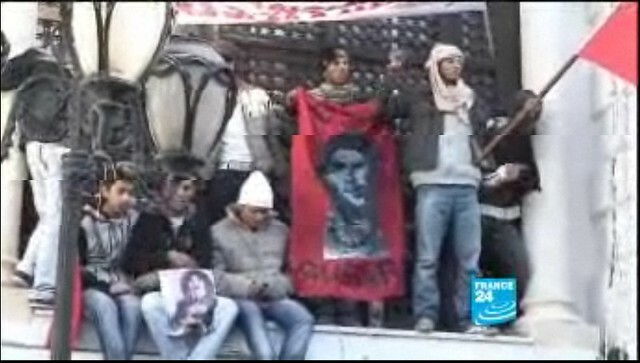 Sunday Tunisia Update: France24 reports Rural protesters reach Tunis, press government to quit. AFP - Some 1,000 demonstrators from rural central Tunisia, calling for the resignation of the transitional government, reached the capital on Sunday. The marchers, from a poor farming region where an uprising against authoritarian rule began last month, called for the resignation of a government put in place after the ouster of president Zine El Abidine Ben Ali. "The people have come to bring down the government," they chanted as they marched through the centre of Tunis. The "Caravan of Liberation" set off on Saturday from the town of Menzel Bouzaiane, where the first victim of a bloody crackdown on protests against Ben Ali was killed last month. Update 23/01/11 12:00pm pst. France24 is reporting the arrest of a private TV station owner and his son in Tunisia for "high treason." They said they have been charged with broadcasting false reports of violence and plotting the return of Ben Ali. This is very early in this story but if it is true, I wonder if there is any connection to the false reports of violence I critique Marc Ginsberg for making in the Huffington Post below. Also a reporter from Paris Match is saying that American Generals phoned the Tunisian Generals and told them that it would be okay with them if Ben Ali went. Nothing firm on this yet. The plot thickens! The France24 piece comes with a good video of what is happening in the streets. This is today in Tunis. I want to take on some of the bloggers that the Huffington Post has featured on this question because I think in may reveal why that website does less to advance humanity than it could - by a long shot. I mean whenever a so-called left-liberal blog is featuring the same talking head on a subject as Fox News...That's your first clue. But we'll get to [former] Amb. Marc Ginsburg in a minute. Now I wanted to make some preliminary remarks about why I feel what is going on here is so important. First on the importance of the hacker group Anonymous. I've been planning to make this the subject of a separate diary but here's the short story. I've been looking for a quote from Karl Marx that I want to reference. Maybe a fellow Kossack can help me out. Somewhere Marx talks about how in the advances of human civilization it's almost like a law that inventions that we once did perfectly well without, after they become integrated into our lives, become indispensable. I believe used examples like the railroad and telegraph from his era. Well, I still would like to find the quote, if someone can help me out, because I always find it interesting to see how Marx reasoned things out, but my main point here is I think that applies to the Internet today. So that is my first point. In the short span of 25 years, the Internet has gone from non-existent to indispensable. That is to say, from this time going forward, no government and no large corporation can expect to function effectively in the modern world if denied access to the Internet. It is that important. Enough hackers, working together, can effectively disrupt any target's Internet use, that is my second point. We have a saying in the free software movement "Given enough eyes, all bugs are shallow." Well I would like to offer a corollary "Given enough fingers on keyboards, any organization's Internet existence can be brought to a standstill." These two observations, I believe, outline the incipient power of the hacker community, which is by and large a working class one, that Anonymous has discovered. It has also developed a style and presentation that is very attractive to young people in general and hackers in particular. While it is far too early to say what the specific role of 'Anonymous' will be in history, it is something entirely new and first efforts often fail, anyone who thinks that they can discount or ignore what is going on here is a fool. I also like the way Anonymous seems to find the right answers to important theoretical questions in a very organic way. For example, it is an international organization with no national boundaries within the group and a world view of it's mission, but it just understands that certain struggles are going to have to play out along national lines, so instead of 'one size fixes all' we have OpTunisia, OpLibya, OpAlgeria. Each considered separately. Each tailored to the specific situation in countries they consider to be entering a revolutionary period. They also appear to be amazingly free of the BS that plagues so many others from the Tea Party to 911 Truthers. This is a trend worthy of careful consideration. I mean even a few months ago, after Anonymous first emerged as a force opposing WikiLeaks censorship, who would have predicted that they would be playing a significant role in a new round of Arab revolts? And who would have predicted the 23 year old rule of Ben Ali was soon to end? Certainly none of these Huffington Post bloggers I am about to critique. We are living in very interesting times. Then there is Tunisia. What most Americans know about Tunisia probably comes from the movie Patton. 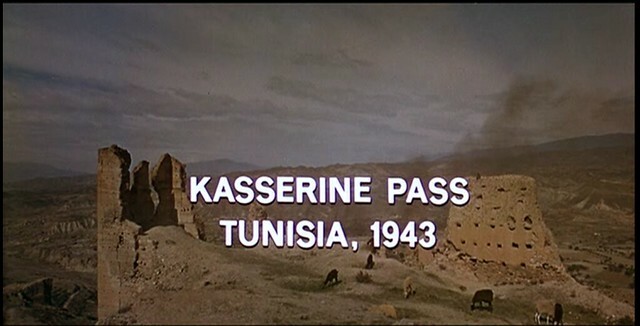 The first scene has the title "Kasserine Pass, Tunisia 1943" but even there, Tunisia was just a place in which western armies fought out their wars. None of the "Tunisians" had speaking roles, if indeed, any real Tunisians were casted in the movie. They just followed the Americans around trying to sell chickens and beg money. They and the buzzards had to be driven off with gun fire. And none of these so-called foreign policy experts, the ones that are so busy assuring us today that the North African dominoes won't fall, none of them predicted the eminent downfall of Ben Ali. But that is what happened. So now we have a revolution in Tunisia and revolt in North Africa, and North Africa is the bridge to both the rest of Africa and the rest of the Arab world, two very large populations very badly in need of radical change. We have this volatile situation and combine it with this Anonymous force of a new type - well that is why I am focused on this like a laser beam - we are watching history being made. We can help to make it! baton-swinging policeman clubbing Tunisian demonstrators literally took up the entire first ten minutes of one news broadcast as the emotional reporter cried into his microphone about the unjustness of Arab autocrats. He prefers the American model were the first 10 minutes can be taken up by Linsey Lohan's latest bust. Note that nowhere in his piece does he discuss the U.S. Media's lack of coverage of events in North Africa. Huffington Post has itself provided little real news about North Africa and I have yet to see a Huffington Post blog that takes the U.S. Media to task for it's lack of coverage. It sounds to me like Al Jazeera is one of the few news organizations around that still practice the journalist's ethic of "comforting the afflicted and afflicting the comfortable." And this week we just lost one of the few American shows that does that. Let me just say as an aside, with all this going on in North Africa, I haven't had time to do my own KO diary, so let me say something here. I have written a number of diaries critical of KO on Countdown only because I felt he was one of the few worth criticizing. One of the few who might listen. I mean with Fox News why bother? I watched Countdown almost every weekday night and it will be missed. I take KO's dismissal as another sign of big Media consolidation and another reason why defending the Internet is so important now. If you want to download KO's last Countdown, here's a link from MSNBC [213 MB ], normally it is up until they post the next show. In this case I don't know. Now back to Marc Ginsberg at the HuffPost. He wants assure us that there is really nothing new to see here and even though "few Middle East observers would have bet their mortgage that despotic Tunisian ruler Zine el-Abdine Ben Ali would lose his iron grip on Tunisia in a little under a New York minute." it is woefully premature to pop the champagne corks extolling the eventual certitude of democratic revolution in the Arab world as if Tunisia were a Hungary, a Poland or a Romania and setting the Arab world dominoes in motion. What happened in Tunisia most likely will stay in Tunisia; it was not a revolution as much as a palace coup. the real danger is that the military will step in and then rule by martial law until it is able to put a lid on the violence and thus determine the ultimate fate of Tunisia's revolt -- something akin to the role that Turkey's military played several decades ago. Marc Ginsburg closes out by saying that "I am just as eager as the next person to see the Arab world's transition to a more just and civil society." sure, just so long as the next guy also works at Fox News. Then he tells us what he really hopes for "Let's hope that Al Jazeera's penchant for regional anarchy is tempered by cooler heads." Does that mean "that the military will step in and then rule by martial law?" Now it doesn't surprise me that Marc Ginsberg would say these things. I wouldn't bother writing this if we were saying it over at Fox News, but he is saying on the Huffington Post! What gives? Next we will look at James Zogby's piece in yesterday's Huffington Post. In Reflections on Tunisia yesterday in the Huffington Post, James Zogby, who is President of the Arab American Institute, places himself squarely outside of the struggle that is inviting the participation of all, including other Arabs. While he finds "Events unfolding there [Tunisia] have been both dramatic and inspiring," He has a lot of questions. "What is not clear is the outcome. Where it goes from here remains uncertain. Will the change be progressive and open to full participation, and will women benefit from this revolt? Answers to these and more questions will be coming in the months ahead when we see how this revolution plays out." Yes, Mr. Zogby, you can watch and cheer from the sidelines, and encourage others to do the same, and "see how this revolution plays out" or you can get involved and do whatever you can to help the people see this thing through to a favorable conclusion. One thing about struggle in the Internet age, distance and even language are no longer a barriers. You and the other critics that take your stance may make light of the efforts of Anonymous all you like but at least they are getting involved in the struggle. And by the accounts of those who are in the struggle, as opposed to those on the sidelines, they are making a difference. Perhaps it is just as well that Mr. Zogby watch from the sidelines because while those involved in this struggle are putting everything on the line in the hope that it will spread and succeed, he doesn't hold out much hope of that. "Notions of 'spontaneous combustion' -- or "what caught fire here will spread there" -- are, at best, apolitical, ahistorical, naïve fantasies." Can't happen. Not going to happen. Of course the phrase 'spontaneous combustion' is his. The people planning strategy, circulating videos, organizing marches and protests, and cracking websites are not waiting for spontaneous. They are taking action. Mr. Zogby knows it's all for naught and he's here to tell you why. "Those who assume that this movement is automatically transferable to other countries, there is no doubt that it is a transformative moment that has inspired many Arabs. But those who force parallels with the fall of the "Iron Curtain" are mistaken. 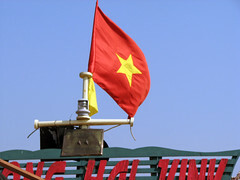 There is no Soviet Empire or occupation army here." Automatically is another of those words activists have little use for. No one is saying it will happen automatically. And yes, there are many difference between the situation in Europe in 1989 and that in North Africa today. We could write volumes about what is different. That's not important. What is important is what is the same and what is the same is that Europe was entering a revolutionary period in 1989 and North Africa is now. It is a time when enormous, dramatic change is possible if we people struggle for it. This is the lesson that the Tunisian people are teaching us now. We can either "Seize the Time" in the words of Bobby Seale, or we can sit on our hands, watch and do nothing as the Huffington Post would have use do. BREAKING - Digital Sit-Ins: The Internet Strikes Back! BREAKING NEWS: Obama Admin Takes Control of Internet Domains! Things Even Keith Olbermann Won't Cover - UPDATE: VICTORY!!! Stop Internet Blacklist Bill Now! Sweet Victory on Internet Censorship: Senate Backs Off! Internet Engineers tell the Senate to Back Off! Why is Net Neutrality advocate Free Press MIA?